Class of 1998 Wide Receiver >>> 5-9, 176 (Oklahoma) 1957-1963 Philadelphia Eagles, 1964 Dallas Cowboys, 1965-1966 Los Angeles Rams, 1967 Atlanta Falcons, 1968 Cleveland Browns Thomas Franklin McDonald. . .Eagles’ third-round draft pick, 1957. . . Career statistics: 495 receptions, 8,410 yards, 84 touchdowns. . . Selected to six Pro Bowls. . .Scored 56 touchdowns in 63 games, 1958-1962. . .Career ratio of touchdowns to receptions 1 to 5.9. . .Led NFL in reception yardage and touchdowns, 1961. . .Ranked sixth all-time in receptions, fourth in yards receiving and second in touchdown catches at time of retirement. . . Born July 26, 1934, in Roy, New Mexico. Wide receiver Tommy McDonald was a third-round draft pick of the Philadelphia Eagles in 1957. An All-America choice at Oklahoma, he won the Maxwell Award in 1956 as college football’s player of the year. During his three years of varsity play at Oklahoma, the Sooners never lost a game. 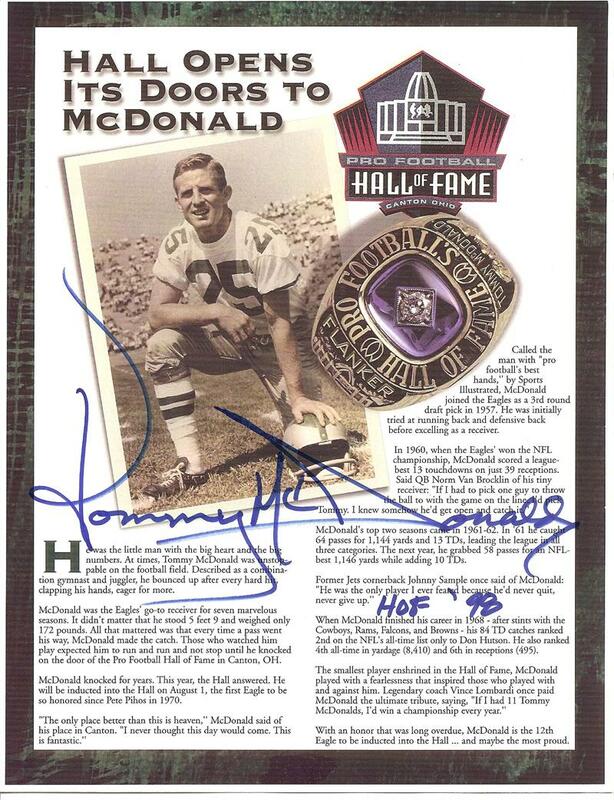 A six-time Pro Bowl selection (1959-1963 and 1966), McDonald played seven seasons with the Eagles (1957-1963), one with the Dallas Cowboys (1964), two with the Los Angeles Rams (1965-1966), and one each with the Atlanta Falcons (1967) and the Cleveland Browns (1968). Although he was just 5-9 and 176 pounds, McDonald was extremely durable and missed only three games in his first 11 seasons. He had elusive speed and used his running skills brilliantly after making his catches, finishing his career with an average of 17 yards per catch and 84 touchdowns. A sure-handed receiver, McDonald had few peers when it came to putting the ball in the end zone. In the years 1958-62, he had 56 touchdown receptions in 63 games, including a 35-yard touchdown reception from quarterback Norm Van Brocklin in the 1960 NFL Championship Game in which the Eagles defeated the Green Bay Packers 17-13. His career ratio of touchdowns-to-receptions is an impressive 1 in 5.9. He also caught at least one pass in 93 consecutive games. Used primarily as a kickoff and punt-return specialist during his rookie season, McDonald ranked sixth all-time in receptions (495), fourth in yards receiving (8,410) and second in touchdown catches (84) when he retired following the 1968 season. McDonald, who was born in Roy, New Mexico, had an outstanding season in 1961. Not only did he lead the NFL in reception yardage (1,144) and in touchdowns (13), but in a game against the New York Giants he caught seven passes for 237 yards and two touchdowns, which is still an Eagles’ single-game best. Your satisfaction is our top priority, which is why we guarantee the authenticity of every autographed memorabilia item we sell. Each item comes exclusively from paid athlete appearances and we deal only with the most reputable suppliers. If it’s from Philadelphia Eagles Online it’s authentic … guaranteed!